"Thank you for your e-mail. I did receive it and she is now a part of my living room. 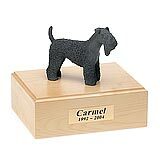 I hope your company will be around for a long time- I plan on using these for all of my pets." 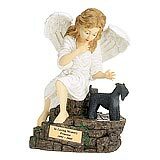 All available Kerry Blue Terrier dog urns and memorials will be displayed with the figurine on the Kerry Blue Terrier urn you select and in the appropriate size.